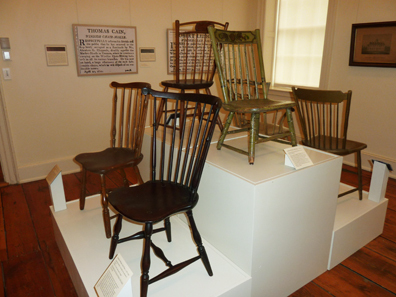 Where else but Princeton’s Morven Museum & Garden would you find an exhibition devoted entirely to the history of chair-making in New Jersey? Even though the museum’s staff is currently working behind the scenes on what promises to be a landmark show this fall, they have brought in a guest curator for a small and informative exploration of the history of chair making in New Jersey that will run through the summer until mid-October. In spite of its cumbersome title, “Of the Best Materials and Good Workmanship: 19th-Century New Jersey Chairmaking” (derived from an 1828 newspaper advertisement of Morristown chair maker J. D. Humphreyville), the exhibition showcases some of the most sleek and elegant examples of the chairmaker’s craft from the 1790s to the end of the 19th century. The show came about after the museum was contacted by a New Jersey collector who offered his chairs for display. “We saw his collection and thought it was an excellent idea; to his items, others were added,” said Morven’s Curator of Collections and Exhibitions Elizabeth Allan. Mr. Hammond has enhanced the display with period advertisements from the early part of the 19th century for some of the hundreds of craftsmen known today through census records, business directories, account books, and research conducted by furniture students and local historians. He will discuss the exhibition during a gallery talk on September 17. The first of these introduces visitors to the process of making 19th-century chairs, including the technique and tools for traditional rush seating. Most of the equipment and tools on display have been drawn from an important collection assembled in the late 1920s by William H. MacDonald of Trenton. Period photographs illustrate how many of the tools were used. Check out the chairmaker’s bench, a rotating stand for weaving rush seats, color grinders used in Allentown for preparing paint, and decorative stencils from several shops in the Allentown and Englishtown areas. Replications of several stencils on loan from the Monmouth County Historical Collection are cut from scrap paper. “It’s amazing that they have survived at all, some of them are so delicate,” said Ms. Allan as she pointed out some for crest rails, some with corner designs and one bearing a chair-maker’s name. They’d be used to apply painted designs. Beside them are some patterns that would be copied by hand. Eight Windsor chairs made between 1790 and 1835 range in form from fan-back and bow-back to rod-back styles, some with bamboo-shaped turnings popular in the early 19th century. They were made in Trenton, Pemberton, Moorestown, Salem, and Monmouth County by Ezekiah Hewes, William Bowen, Samuel Jaques, Samuel Roberts, William McElroy, Ebenezer P. Rose, and others. Brands were often stamped on the undersides of chair seats and can be used to identify the work of specific craftsmen. Throughout the 19th century, a wide range of common and fancy chairs were made in all parts of New Jersey and there are 15 examples of these in the exhibition. Seven of them were produced by the renowned Ware family of South Jersey, who made slat-back, rush seated chairs in the Delaware Valley tradition in Cumberland and Salem counties. Nineteen Wares over four generations engaged in chairmaking from the late 18th century to the 1940s. The techniques passed down in the family remained so similar that it is often difficult, if not impossible, to tell the work of one craftsman from another. After the Civil War, chair production in New Jersey shifted from small shops to factories. Three of the most prominent were the Gardner Manufacturing Company of Glen Gardner, Hunterdon County; the Tunis R. Cooper chair factory in Bergenfield, Bergen County; and the Collignon Brothers in what is now River Vale, Bergen County. Twelve examples from all three factories display the special characteristics developed by each, including the Collignan Brothers’s patented folding chairs. Highlights include the hand-painted crest rail depicting a compote of berries on a Windsor side chair made by Ebenezer P. Rose, Jr., of Trenton, ca. 1815-25, and the graceful bow-back Windsor armchair made by William McElroy of Moorestown, N.J., ca. 1795-1810. One period photograph shows Samuel Sloan Ware (1848-1920) on the porch roof of his second floor chair shop in Alloway, New Jersey, ca. 1875, which comes from the Joseph Downs Collection of Manuscripts and Printed Ephemera at the Winterthur Library. Another, by Edward W. Humphrey, records the interior of Dan Ware’s chair shop in Woodstown, Salem County, circa 1895. “Of the Best Materials and Good Workmanship: 19th-Century New Jersey Chairmaking” will be on view at Morven Museum & Garden, 55 Stockton Street, Princeton, through October 18. Hours are Wednesday, Thursday and Friday, 11 a.m. to 3 p.m.; Saturday and Sunday, noon to 4 p.m. Admission: $6, adults; $5, seniors/students; free to children 6 and under and Friends of Morven. For more information, call (609) 924-8144, or visit: www.morven.org. And the landmark show coming up in the fall? “Charles and Anne Morrow Lindbergh: Couple of an Age,” the first large-scale exhibition to explore the vices and virtues of this prominent couple, will open November 13. For a sneak peek, visit: www.morven.org.